David drew us all in from the outset as he informed the students how audiences are usually built for programmes and introduced the concept of the ‘inheritance factor’ when at least 50% of the audience is inherited from the previous programme. This certainly applied in the days when there were only a three TV networks – and probably still does to a considerable extent. He gave the example of Planet Earth II being followed by the hugely popular Great British Bake Off, - although he was quick to point out he didn’t watch cookery programmes himself! He put his popularity down to the fact that he had been appearing in natural history programmes for as long as most viewers could remember. On how he writes narrations, David said: “When I happen to see a programme that I narrated a long time ago I almost invariably feel that there were too many words! A commentary should not blather but let the pictures tell their story. It should never give information that viewers can see for themselves. The conversation then turned to the prehistoric as David was asked to choose which prehistoric place and period he would like to visit and what he would make a film about. “It would most certainly be terrestrial and probably Triassic. Surprisingly little has been done on pterosaurs. We still don’t know how some of the really big ones flew.” David then regaled us with a charming story about telling a lady at a black tie event how he was making a film about pterodactyls gliding over the cliffs of Dorset, to which she replied, ‘Oh they are so lovely aren’t they!’ and turned away. “You should not conceal the way things are filmed, but you need not necessarily declare it. The classic case was in Frozen Planet. We filmed a polar bear giving birth and in the credits, we credited the zoo where it was filmed. A journalist noticed this and accused us of fakery because we did not say so in the commentary. The midwinter birth is a crucial event in polar bear biology. It would have been impossible to film in the wild without risking the life of the cub, the mother – or indeed the cameraman. But it would have been absurd and defeated the purpose of the film to convey the reality of the Arctic winter to interrupt and say ‘by the way this scene was shot in captivity’. We were not shooting a documentary about the experiences of an arctic explorer. We were trying to convey the reality of a polar bear’s life – and we can therefore use background music, or cut together shots of different individual animals or different localities to do that. The question simply is whether or not the filmmaker is trying to tell the truth. 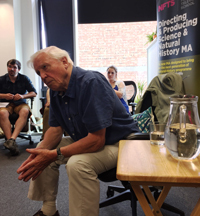 On how to inject emotion into a film with a hard-hitting conservation message, David advised that “you have to start by producing a rational argument using cold, clinical facts. Pleading a cause without a rational basis is dangerous. Nor do you necessarily have to provide answers to issues. Broadcasting on a national network is a huge privilege only given to few. It should not indulge in propaganda, no matter how high-minded the issue. Instead, it should strive to present both sides of an issue with such force that it cannot be ignored. A question followed about whether future generations will lose touch with wildlife and how to combat this. “The industrial revolution led to great numbers of people losing contact with the countryside. There are great advantages and pleasures in living in cities. I live in London by choice. I love the theatre, museums, and have a wide range of friends. But I’m aware that if I didn’t get away, I’d lose touch with the natural world which I also treasure. TV is very important in maintaining a link to the natural world. So people now can be more knowledgeable than they have ever been about the nature world-wide. And that is of great importance when the natural world is facing such grave threats”. David had plenty of good advice for young filmmakers and on what it takes to succeed: “One thing you want is dedication and the ability to take the rough with the smooth. Persistence and being serious about what you are doing is key.” And the best way to convince potential employers that you deserve a chance is to make a 10 minute film to show what you can do.